With our rinser, any vessel with a diameter from 1 to 41/2 inches can now be rinsed in seconds. In most restaurants, coffee shops and cafes, the rinsing of glasses, shot glasses, pitchers and cups is a task that is repeated many times a day. we Have developed the rinser to save you time and money, making the rinse process an effortless task. 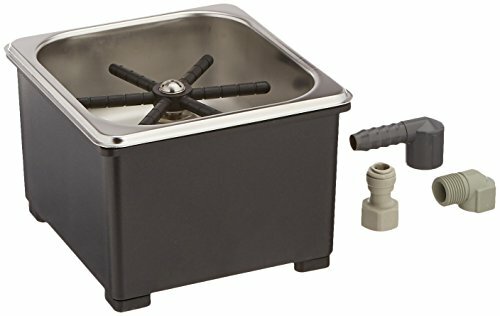 Specifications: COLD water connector: 3/8" john guest press fitting (hot water damages the seals)drain connector: 1/2" barb fitting Recommended water pressure: 15-30 PSI Rugged black abs surround outside dimensions of the pan only: 6-7/8" by 6-3/8" (average flange is 5/16")stainless steel pan (edges can be sharp please use caution when handling pan). Certified NSF/ANSI 169 - Special Purpose Food Equipment and Devices. If you have any questions about this product by EspressoParts, contact us by completing and submitting the form below. If you are looking for a specif part number, please include it with your message.